1. The first jaywalker is complete. It is beautiful, and I can't wait to finish the second so I can wear them together. Please do not mind the incredibley white leg.... hehe. 2. I have been granted an interview with the Ohio State University College of Veterinary Medicine. On February 14th, at 11 am, I will be deciding my future. AH! My cell phone has been taken by a very gruff sounding urban man. He answered when my mother called and proptly told her I was "at the store." My poor mother. I've decided to be a follower. Last Saturday, the boy took me to the yarn store (aw). 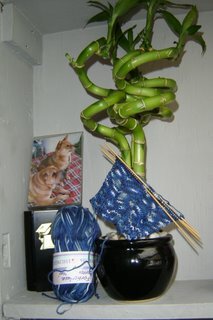 I bought two skeins of beautiful blue sock yarn and a pair of US 1 Clover bamboo needles (mm). The woman at the counter, after she had so wonderfully made my boy comfortable in the waiting area, asked if I was making socks. Why yes, I was preparing to attempt the Jaywalker socks that everyone seems to be so successful with lately. 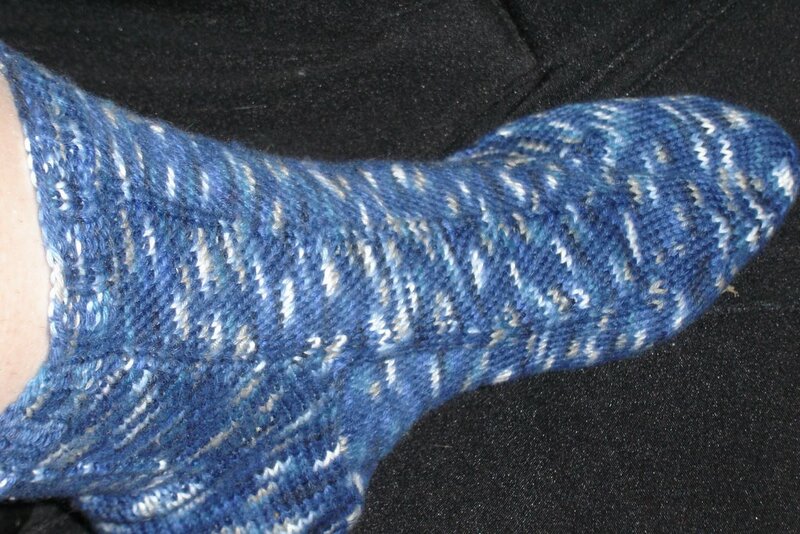 I now have turned the heel and I am almost done with the heel gusset decreases. 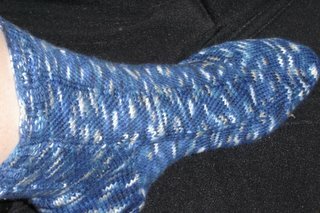 It is really going to be a beautiful sock! In other news, I have been working everyday 10am-5pm at the vet hospital and 4:30-9:30 at the Newman Center. It is very exhausting, but I am loving every minute. I get to learn so much every day. I hear things at the vet hospital that I don't understand and I go home and research each evening. I have already learned about tplo surgeries, dcm, and several other things. It is also an excellent way to review my knowledge of medical termonolgy. That is all for now, peace.